You are going to Watch One Piece Episode 406 English dubbed online free episodes with HQ / high quality. Stream Anime One Piece Episode 406 Online English dub Feudal Era Side Story – Boss Luffy Appears Again. 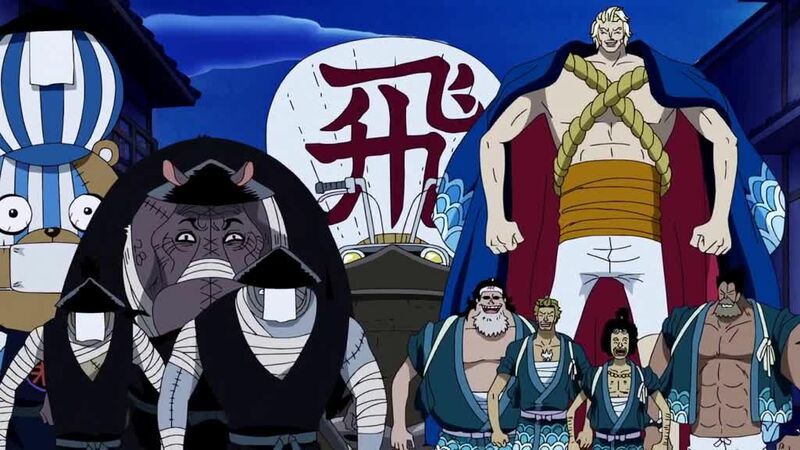 In an alternate universe set in Edo period Japan, the Mikoshi race is about to take place, the winner of which receives a million Berries, and Boss Luffy and his friends recruit Franky to build them a mikoshi. Meanwhile, Thriller LTD enters the race, and begins working to sabotage its competitors, including groups based on the Flying Fish Riders and Rolling Pirates. The crew meets up with Brook, who cannot remember anything other than his own name, and tries to stop Thriller LTD from interfering. They arrive to find their mikoshi destroyed, and Brook remembers that he was once part of Thriller LTD before trying to leave and being thrown in a river by Hogback, Perona and Absalom.